Wisconsin Democrats are rallying behind Vice Presidential nominee Joe Biden. The U.S. Senator from Delaware delivered his acceptance speech Wednesday night in Denver, and was greeted warmly by members of the Democratic Party. Wausau-area delegate Christine Bremer Muggli says Biden was fabulous and really wrapped up the first few days of the convention. She says Biden&apos;s speech helped to vitalize delegates and show them why Republican John McCain can&apos;t be allowed to win in November. 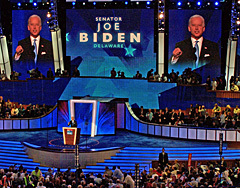 State Senator Pat Kreitlow (D-Chippewa Falls) says Biden&apos;s speech was exactly what delegates were looking for. He says it helped introduce Biden to the nation and show why he was the right choice for Barack Obama&apos;s running mate. Biden was briefly joined on stage by the Democratic Presidential nominee. State Party chairman Joe Wineke says that was welcome surprise, but added a perfect touch to the evening. Wineke says Biden showed he&apos;s ready to be the Vice President of the United States.